Marantz PM8003 review | What Hi-Fi? We all know interminable waiting for a hot date is a recipe for disappointment. Take this amplifier, for instance: it's Marantz's latest, the PM8003, and it proved as elusive as Nessie for months, until at last we secured a model to review. And now that our chance has come at last, we're strangely anxious. Sure, the Marantz looks as good today as when we first saw it, but the reality can't match our fevered imaginings... can it? First impressions are certainly no let-down. From the length of its spec sheet (five line-level inputs, two of which are tape loops, moving-magnet phono stage, binding for two sets of speakers via the most impressive binding posts we've seen for many a while) to the hefty precision of its build, the PM8003 looks and feels well worth the asking price (even if you have to overlook its dreary remote control). In most ways, it sounds good value, too. Given something as taxing as Simian Mobile Disco's Hustler to deal with, the PM8003 offers a sprightly and impressively staged performance with more low-frequency gusto than recent Marantz efforts had primed us for. Driving smartly through the martial tempo, the '8003 presents a coherent stereo image and has all the urgency the song requires. This energy doesn't translate into out-and-out dynamic ability, though – Television's Marquee Moon suffers from this relative lack of thrust, and when a symphony orchestra rumbles on to a war footing, the Marantz doesn't have the reserves to maximise the shock and awe. Nor does it have the resolution or insight that its (admittedly prodigiously talented) rivals such as the Roksan Kandy K2 and Naim Nait 5i do. None of this makes the PM8003 anything less than a thoroughly enjoyable amplifier. In fact, given the length of time we've had to build it up in our heads, we'd say it's delivered the majority of what we'd imagined it would and, where low-end drive is concerned, a little bit more. 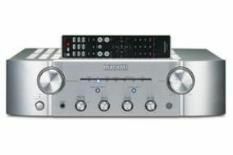 But the Marantz just falls short of some stellar competition at this price, and that's why it can't manage a fifth star. Of course, given the time it's been on sale you may be able to find one usefully discounted, and if that's the case we'd suggest you hear it pronto.